A river keeper unit has been set up to assist in protecting elephants and other wildlife at the Lower Kinabatangan Wildlife Sanctuary. He however said initiatives such as the river keeper unit initiated by the department’s partners – Danau Girang Field Centre (DGFC) and HUTAN – for conservation in the Kinabatangan would greatly assist in monitoring wildlife and threats to wildlife along the river and within the sanctuary. The River Keeper Unit is jointly set up by the wildlife Department, DGFC and HUTAN and funded by Elephant Family and the Kinabatangan-Corridor of Life Tourism Operators Association (KiTA). Hailing from the local community, Mohd Syafendy Yajit and Sudirman Sawang are well suited for the job as both have years of experience working with HUTAN – Kinabatangan Orangutan Conservation programme. “They have a lot of field experience, especially on elephants. Both of them are also honorary wildlife wardens,” said Dr Marc Ancrenaz, HUTAN’s scientific director. The unit will conduct day and night patrols to monitor and prevent illegal activities such as encroachment in riparian reserves, illegal logging and hunting along the 260 km of river within the LKWS, from Lokan to Abai villages,” said Dr Marc Ancrenaz, HUTAN’s scientific director. The River Keeper Unit, he said, would be based at DGFC and its other function is to monitor tourism activities along the Kinabatangan River. “They will stop boats from going too close to the elephants or tourists disembarking on land. “Although tourism can boost economic development, ill-managed activities can also be a nuisance to elephants and their habitat. 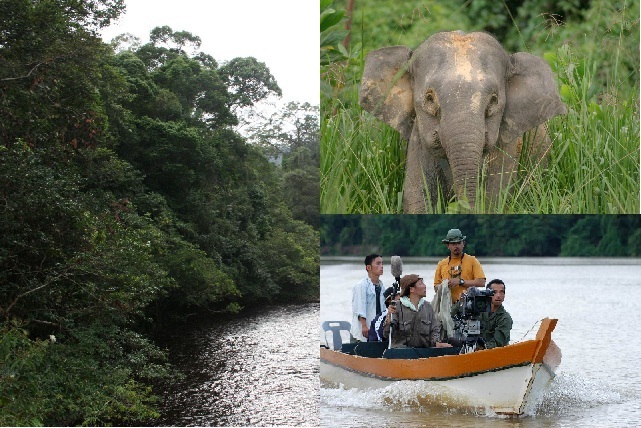 “And, with this in mind, one of the major roles of the River Keeper Unit will be to investigate elephant responses to tourism activities along the Kinabatangan and to come up with wildlife watching guidelines that will be provided to the different tour operators,” said Dr Benoit Goossens, director of DGFC. KiTA member Alexaander Yee said they are delighted to be a part of this initiative to secure a haven for wildlife in Kinabatangan. “We are all aware that our tourism activities depend on effective wildlife enforcement and protection and we are prepared to extend financial assistance to the River Keeper Unit,” he said. KiTA consists of nine tour operators operating in the Kinabatangan area.